Tasteful tortillas soup with fried corn tortilla strips and diced chicken breast served with sour cream and avocado. Fresh salad made with crispy lettuce, cheese, avocado, cucumber, fresh tomatoes and red onion. 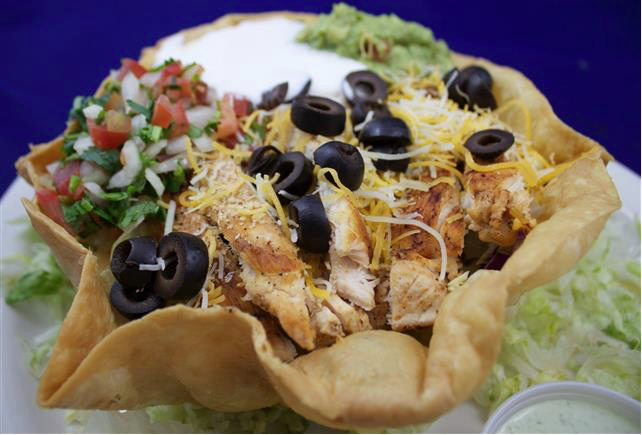 Lettuce served in a hard shell taco crust, topped with your meat of choice, Beef or Chicken, onions green and red bell peppers, guacamole, sour cream and pico de gallo.